Happy Wednesday, Friends!! I really love Wednesdays, the day when lunch lingers a little longer because I lack the will power to pull myself away from all of the goodies that my favorite bloggers have shared in their What We're Reading Wednesday posts at Housewife Spice or their Five Favorites at Moxie Wife. Pouring over them with a cup of tea, notepad and pen in hand, has a magical way of diffusing the testosterone army of chaos that routinely streaks through my house wielding Nerf guns and swords. I love it (the blogs, the blogs! ), I tell ya! "Out of the depths of the Depression comes an irresistible story about beating the odds and finding hope in the most desperate of times - the improbable, intimate account of nine working class-boys from the American West who at the 1936 Olympics showed the world what true grit really meant." I'm really drawn to stories that are written about unlikely heroes, underdogs and the like. 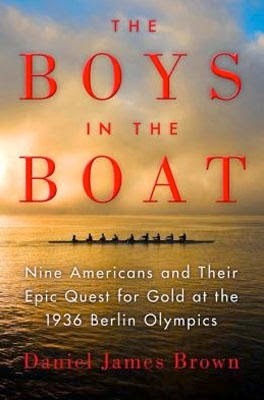 And, as a lover of history, The Boys in the Boat packs both a great story of human endurance and triumph as well as glimpses into Great Depression and pre-WWII into it's pages. Reading Brown's book has also opened my eyes to the beauty and discipline in the sport of rowing (so much so, that I foresee a rowing machine taking over some Lego space in our basement very soon. Thank you, e-bay.). I must confess that this book is here entirely due to the fact that I was under the blogger influence when I bought it. A few of my favorite writers mentioned it on their sites, so I caved to their cyber suggestion, added it to the ol' Amazon cart thinking that I would read it aloud to the boys. Honestly I'm just not a fan of current day literature, especially what is written for kids. Call me ancient, but I cannot help but love the classics, and therefore, my kids also read from our "Great Books" list ,too. 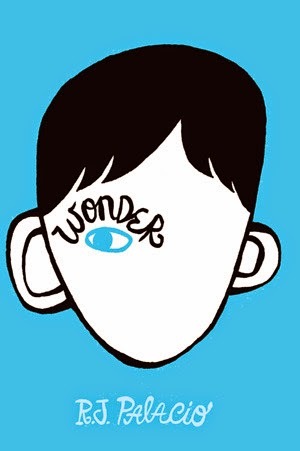 Reading Wonder aloud has been a challenge for me. The author, writing from the perspective of various characters, has chosen a language style completely true to the way in which we converse today (oi). Even though Wonder is "real life" reading, I struggle to get through the pages, simply because I am not inspired, whatsoever by this modern, conversational style of writing and storytelling, and must depend solely upon content as motivation to keep reading. That being said, even though Wonder is not a book that I believe my boys would particularly enjoy reading on their own, it has offered us several opportunities to engage in rich and meaningful discussion on virtue, suffering, compassion, empathy, fear and social influences, and to examine our own perceptions of and behavior towards others, which has been of great value. and there is no ideal higher than Christ crucified." 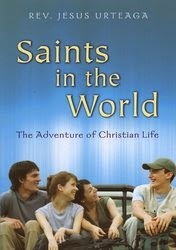 If you are looking for a spiritual life boot camp, this one is a doozy. It's one of those books that Steve and I both reach for time and time again throughout the year, reading excerpts aloud to each other when we're needing a little push interiorly. We picked it up again during Lent, and I was reminded of what a treasure this little book is in our library. Several months ago, my sister, Sara sent me the most beautiful care package in the mail. Included in the box of goodies were a lovely selection of stationary and papers from the Rifle Paper Company. In a world of texting, e-mails and phone chatting, receiving hand written notes on beautiful paper has become a lost art. I'm hoping for it's revival, and should there be, I'll know just where to go to stock my stationary box! The company, which is included on Martha Stewart's American Made website, also offers calendars, frame-worthy prints, phone cases and more! By the way, have any of you been watching Signed, Sealed and Delivered on the Hallmark Channel? I am loving it! If it doesn't make you want to pick up a pen, I'm not sure what will! Than he who is living in the world. Easter joy is alive and well in our home! Every day, we've been listening to praise music in the afternoon while tidying up the house before Steve comes home from work. This song by Mercy Me is definitely the boys' favorite. I wish I had a video of Charlie dancing to it, because he absolutely goes bananas! It's one of those tunes that can turn around a bad day, really! I hope you like it, too! Have a lovely day, everyone!! I love how songs of praise and prayer can turn a day around so quickly! We do the same. We've been listening to Matt Mahar songs and Audrey Assad at different points. I love it! And, I love seeing the boys enjoy the songs and lyrics too! I LOVE Audrey Assad!! She is truly one of my favorite Christian artists! Rifle Paper Co stationary is a favorite of mine, too! Such gorgeous stuff. It's so hard to resist buying a little of everything from them, it's all so lovely! Looks like y'all are reading some good books and listening to some great music! I hope that the contractions you mentioned last week have stopped and that you are still growing that little one!!! Oh, those contractions! I'm not sure what's going on, but every day I have a few, and then they go away. I think this baby might be in a hurry to get here!